Similar budget priorities from Republicans and Democrats bode well for an on-time finish this year in Olympia, if each side is willing to compromise. WASHINGTON state tax revenues have snapped back from the Great Recession because of the white-hot Seattle economy, even as much of the state is still struggling to recover. More revenue eases the Legislature’s difficult job of molding a 2015-17 budget, but lawmakers should remember the painful fiscal lessons of the very recent economic past, when it was forced by austerity to prioritize. Two new proposals for the budget, emerging from the Democratic-led House and Republican-led Senate, start with broadly similar themes and worthwhile priorities. Commonality should breed negotiation, and that should help Olympia avoid the marathon overtime sessions that plagued recent budget negotiations. Both proposals vastly expand education funding to comply with a state Supreme Court contempt order for not adequately funding K-12 education. They make higher education more affordable and open more access to early learning. Both also recognize that Great Recession-era cuts to mental-health care were unconscionable and must be reversed. For the K-12 education system, the consensus in Olympia is to add at least $2.7 billion over the next two years, and to suspend Initiative 1351, the massively unfunded class-size-reduction measure, in favor of more targeted, research-supported class-size reductions from kindergarten to third grade. Adding so much money to the system, however, must not be an attempt to just earn a hall pass from the Supreme Court. It must also buy better outcomes for students. Just 77 percent of students graduate on time; rates for black and Hispanic students remain at least 10 points lower. Even fewer graduate ready to take on college or career without remedial classes. The House budget spends $460 million more on education than the Senate, most of it on teacher pay raises. The Senate budget gives teachers a cost-of-living raise; the Democrats in the House give them that raise, plus another raise, plus a generous added stipend for health care. 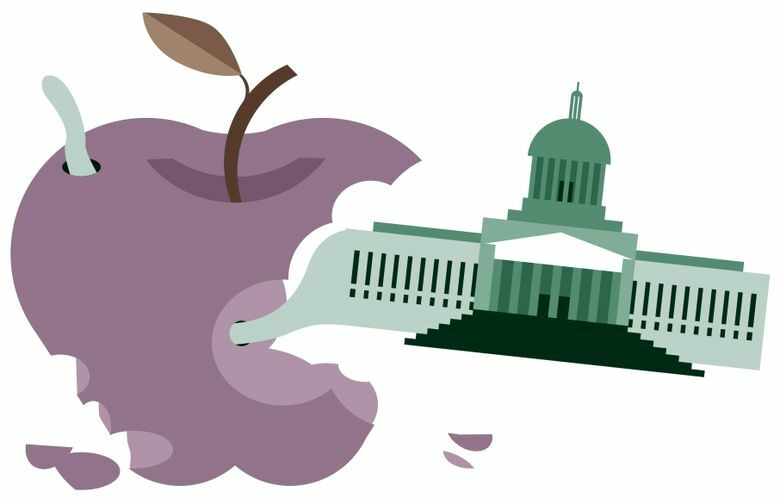 That largesse will please the powerful Washington Education Association, which pushed the unfunded class-size-reduction initiative. Here’s the crucial question for lawmakers: What will this supersized pay bump buy? Better outcomes or labor peace? Both budgets wrestle with the burden of a multibillion-dollar increase in education spending without whacking higher-education budgets or the safety net. The Senate budget does it with no new taxes, relies on likely unsustainable gimmicks and fund transfers. The Legislative session is scheduled to end April 26. Focusing on the common priorities, and what new investments would actually buy, might just allow lawmakers to hit that deadline.